Home / Posts tagged "Dance"
Pashtuns have always been misunderstood as the backward folks of the Khyber Pakhtunkhwa region which is entirely a baseless accusation. In earlier days, people- even foreigners- would visit the province, especially for its culture and customs to experience the art forms that were the sole remains of the Mughal dynasty. What they cherished and took great interest in is the dance form “ATTAN” that they found bizarre and exciting at the same time. 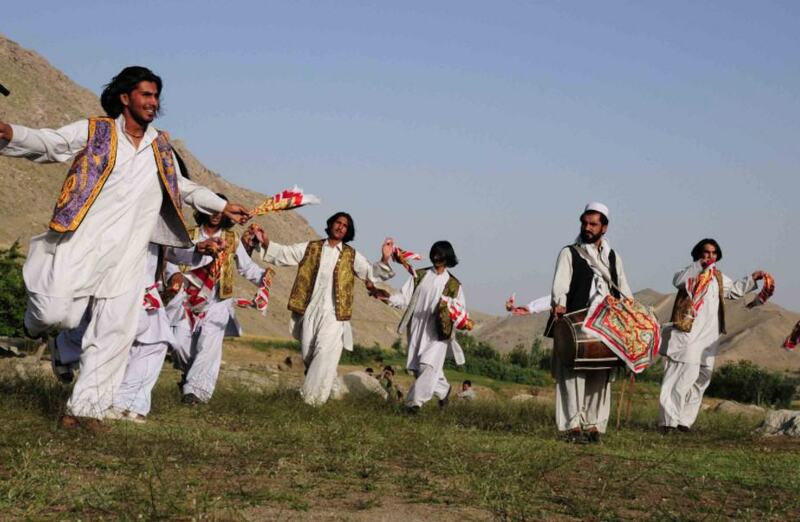 Attan was initially the popular dance form of Afghans which later on was adopted by the Pashtuns in Pakistan after Afghans’ migration. It slowly and gradually hyped and became a tradition for men to perform before going to specific missions. Later on, the dance was practiced on weddings, college, and universities on specific events. Special costumes that are mainly Shalwar Kameez with fancy waistcoats and Afghani topi for men while afghani fancy embroidered frocks with Khussas for women. From that time, Attan changed many forms as handed down the generations but the key instruments for its music never once changed. It has always been the double-headed barrel (Dhol), tabla, Rabab and the flute. Nowadays people perform Attan on multiple modern Pashto songs but the original Attan is still practiced in authentic Pashtun culture. The significance or the signature step of the Attan is the “turns” that the dancers take while performing. Based on the turns and movements Attan has further given origin to Kabuli, Khattak and Wardaki attans. Men and women perform 2 to five steps with each one ending with a clap in the center of the circle. The arms, legs, and wrists tilt and twist in a particular motion as signaled by the beat. Khattak attan originated from Mughal rulers. This has swords and the typical turns and twists of the attan including a half spin and then a full spin the reversed direction. The specialty of this attan is the colorful handkerchiefs in each of the dancer’s hand. The handkerchiefs are shown high above the head while taking twists and turns. No clapping is involved in this type. How do cultural dresses make you stand out in the crowd?